For me anyway. But it is the 70's and it is ABBA - who always loved a bit of flare!! Have found a new (for me) digi challenge site - Digi Dares and this weeks guest designer is Amy Wolff whose work I have been known to use over at The Lilypad. All of the elements are from The Lilypad as well. 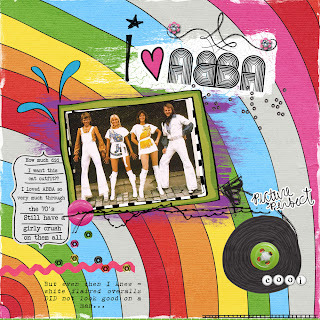 And none were bigger for me than ABBA - I had all their albums and still know all the words off by heart. My brother was enormously annoyed when Money, Money , money was #1 for so many weeks, keeping David Dundas (Baby makes her Blue Jeans talk) to #2. I never got to see them live but I have been to a couple of cover band concerts - so much fun. Ok, morning of the wedding an old white Jag turns up - looks OK - on the outside at least, best not mention the inside. My eldest brother, designated driver of this car (police rank of Seargent at the time) looks at it and enquires - how reliable is it? Hmm, not so sure says the owner (not known for his reliability), haven't filled the tank in a while, actually haven't driven it in a while -oh by the way - it's NOT REGISTERED. eep. Eldest brother makes decision, it's only around the block to the church,and a bit over a kilometre to the reception. We'll risk it. My request to go around the block twice to calm my nerves (more of that next time) was rejected outright - quite tersely for some unknown reason (hey, not my fault I would have been happy to walk). He declared it the biggest pile of junk he had ever driven and considering his personal car history including one Datsum Leyland that only drove once before dying - that was some statement. He needed a few ales to calm his somewhat jangled nerves. We made it and ended up taking our own car back to the motel, The Jag got left in the reception car park. And Rob (youngest brother) will never be allowed to forget. He claims total victory though as we never ran out of petrol (failing to mention the illegal status though). So come and join us At Another Freaking Scrappy challenge with your own wedding tales, lots of fun. 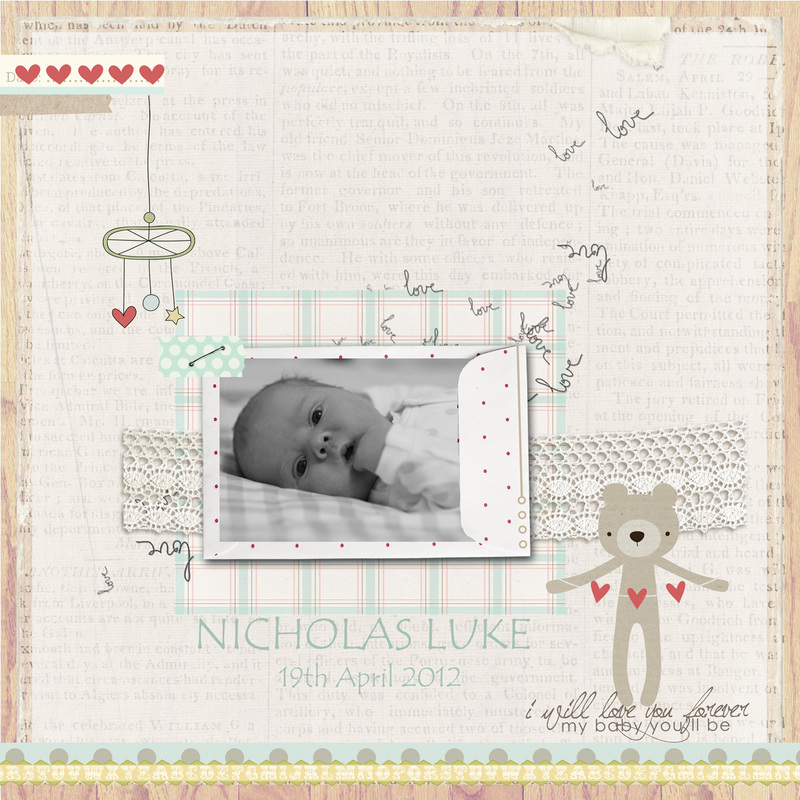 oh and one last scrap page I did for my friend Alicia who recently had a gorgeous baby boy. which gave me the perfect excuse to use this kit by Sahlin Studio. so cute. I am sooooooo there with ABBA....we could get together & have an ABBA fest!!!!! Meant I was a sucker for the musical....even Pearce Brosnan ( cringe) .....LOVE the LO. So perfect... As is the sweet boy. Oh my! An unregistered car driven by a copper.....that's a good one. We won't tell!!!!!! If you all are having a party I wan in!!!! And we can get a car that Is registerd to drive there!!!!! Love your pages!!!! Abba my fav tho! A wedding Lo and something special for Lizzy!